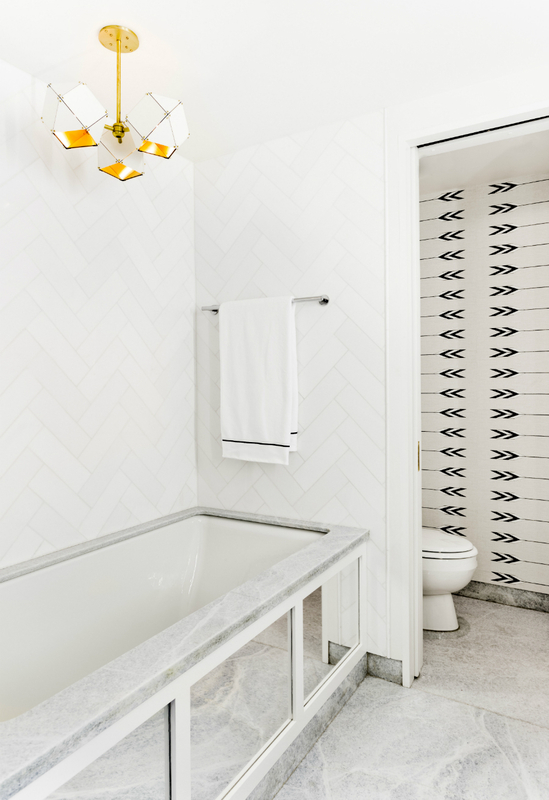 Sleek, modernist and glam aren't the words that usually come to mind when I picture "Parisian farmhouse" style, but call it what you will, Tamara Magel, because your latest project is giving me all the feelings! Designed for a Manhattan power couple as their first home together with their baby, the elegant but previously outdated unit at One Fifth Avenue was filled with dark artwork, furniture and floral tapestry. 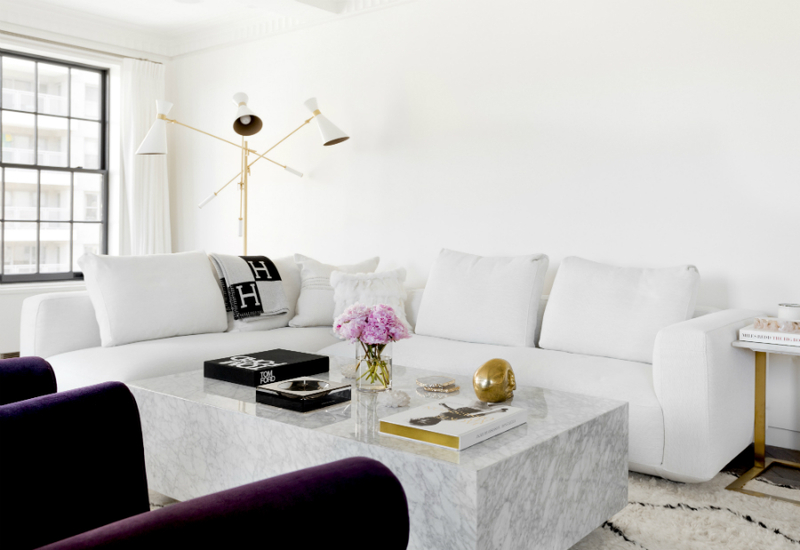 Magel renovated the place from the ground up with chic herringbone floors (my favorite! ), classic black trim, clean white walls and artwork commissioned by her long-time friend, Peter Brockman. 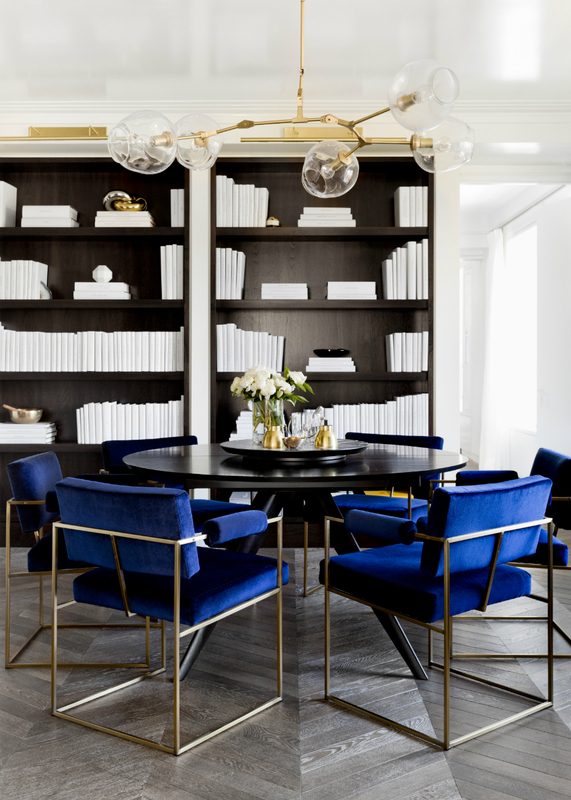 The dining room took center stage for the entertaining-loving couple, with jealously-inducing blue velvet chairs by Milo Baughman. 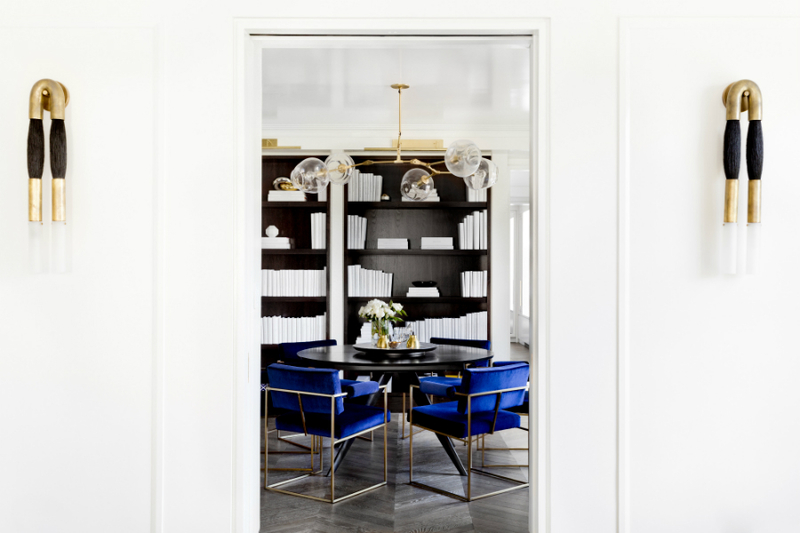 A set of six surround a black lacquer dining table that can be expanded to accommodate 12, and a one-of-a-kind blown glass chandelier by Lindsey Adelman hangs overhead. Masculine elements continue into the bedroom, where an $8,000 silver fox duvet cover drapes across the bed (conspicuous consumption be damned! 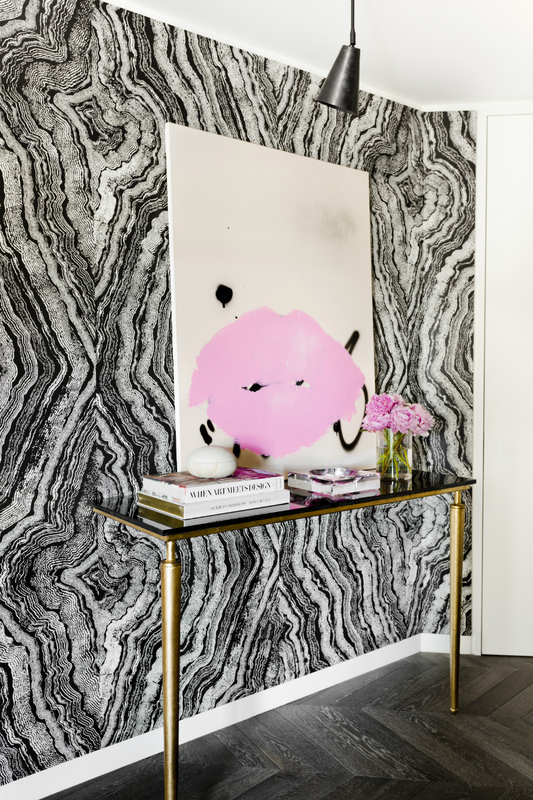 ), and a black accent wall serves as a backdrop for Brockman’s art. 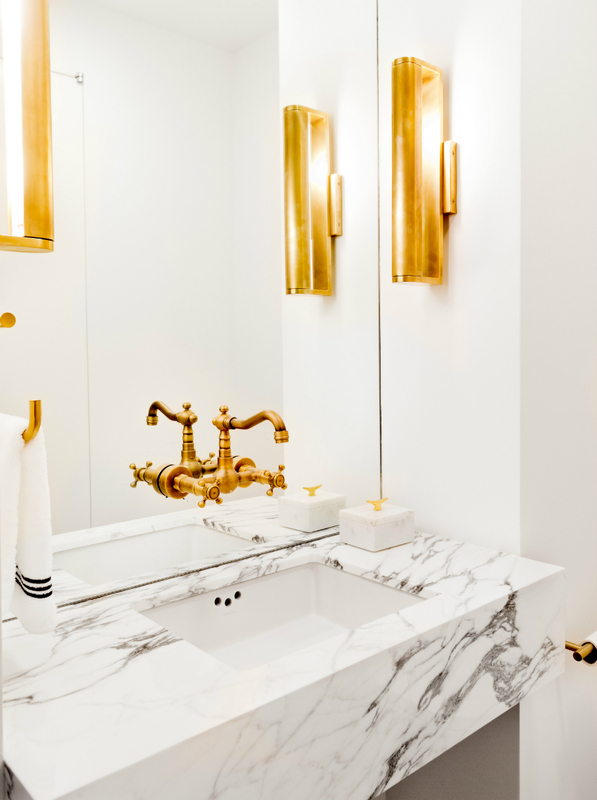 Magel chose a smooth white and black marble custom-made sink and an antique gold faucet for the bathroom, repeating the same white and gold accents in the oversize dressing room. 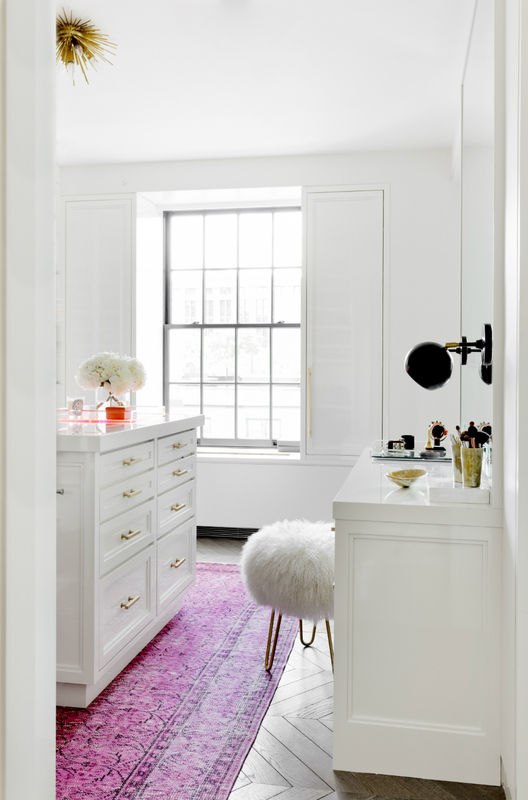 Here she added a stylish over-dyed rug and white pouf stool at the vanity for some modern femininity. A pair of 1940’s purple velvet armchairs are the standout pieces in the living room, though the cute pup below seems to be stealing the show. If this is what farmhouse chic looks like, I'm in! By the way, the winner for the Minted giveaway has been announced. See if it's you here!